If you didn't observe how famous glass railings are these days, you will know why after seeing this post. Of course, in order to reach an upper level in the house, one needs to use the stairs. The stairs come in different lovely designs. It could be a simple modern stairs with floating trends or a classic one made of wood with intricate carvings on its balusters in the railings. Or it can also be a small staircase for a home with limited area or maybe a spiral stairs. 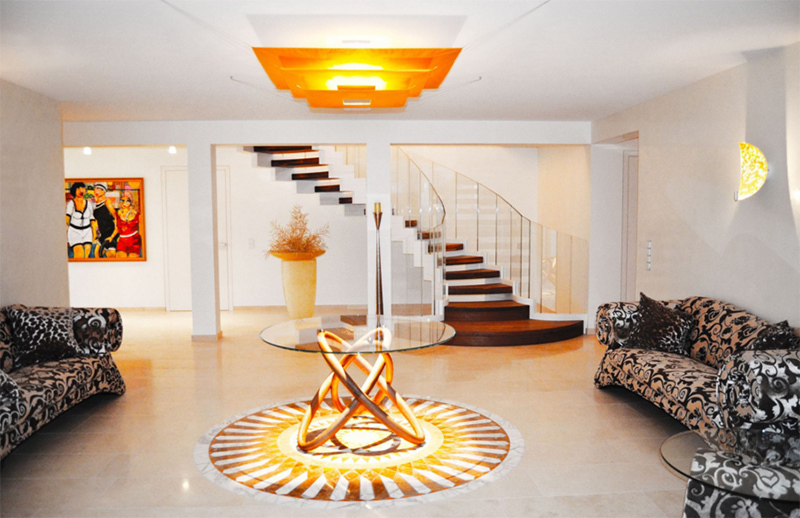 Stairs come in various designs and today, we are going to show you one type of stairs. 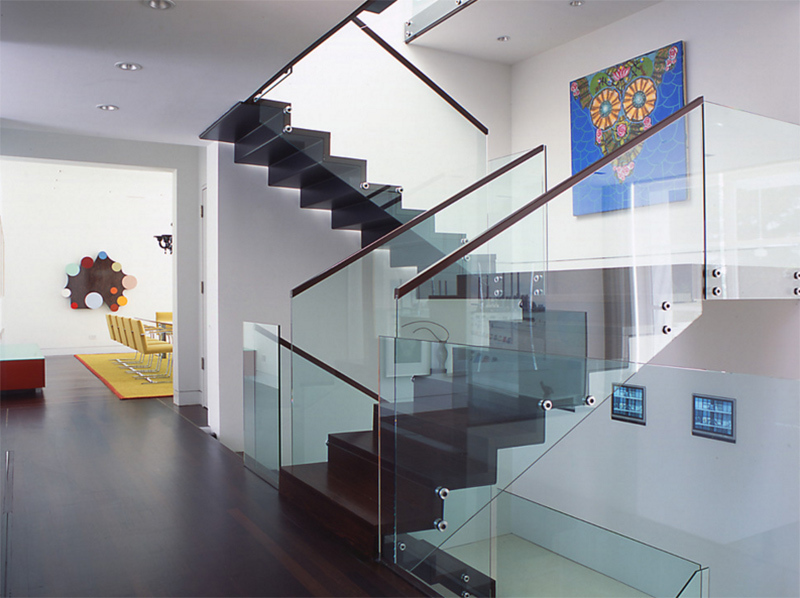 With the modern and contemporary home design trends these days, you can commonly see homes with stairs that has glass railings. It could either be combined with wood or stainless steel or sometimes these are left frameless which is also a good idea. What is good about glass is that it can be used in various forms and styles from straight ones to curvy ones. 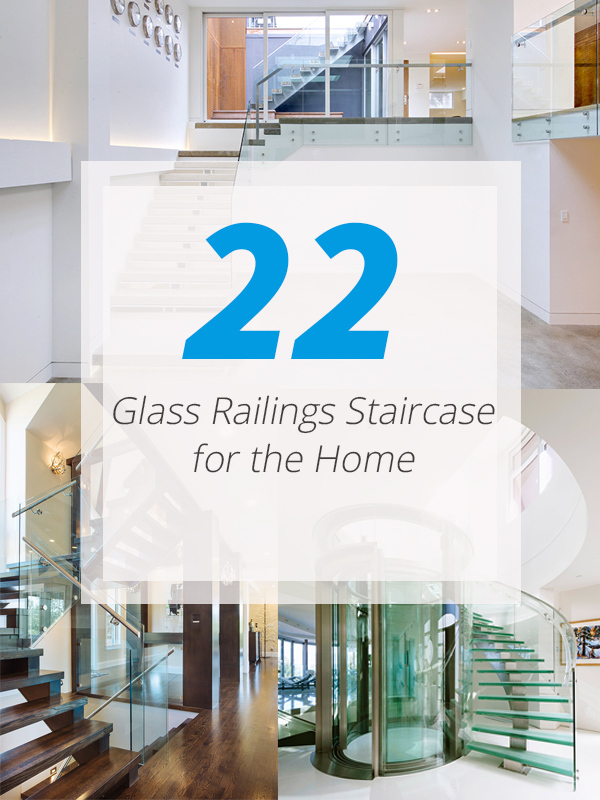 Hence, we created a roundup of stairs with glass railings inside homes to give you an idea of what design suits your house best. Glass railings may look fragile but when installed properly, it can actually be a sturdy and beautiful material for the home. The house isn’t just lovely with its floor to ceiling windows and interiors that are flooded with natural light. 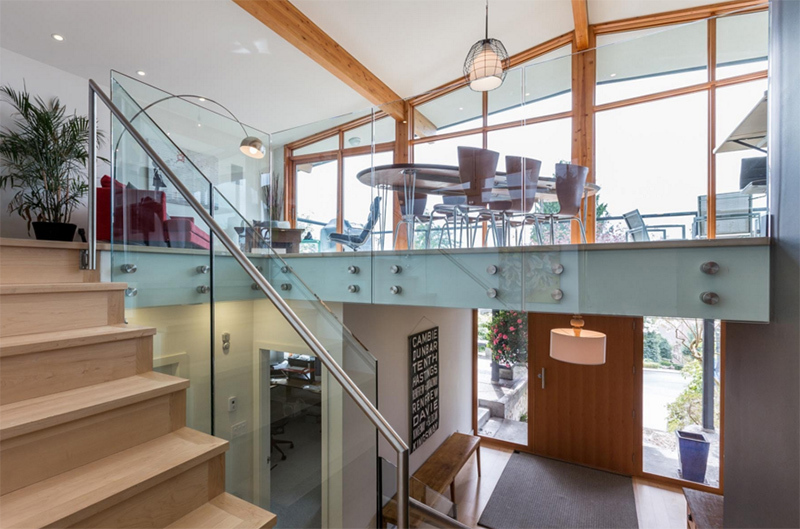 But it also looks nice with that wooden staircase that has glass and stainless railings. A house made of concrete has glass railings on it that made it appear like there is nothing there at all! Isn’t it nice that the backdrop here is a shelf full of books? I don’t know about you but I really like it when I see so many books. The stairs here used wood and glass combined. 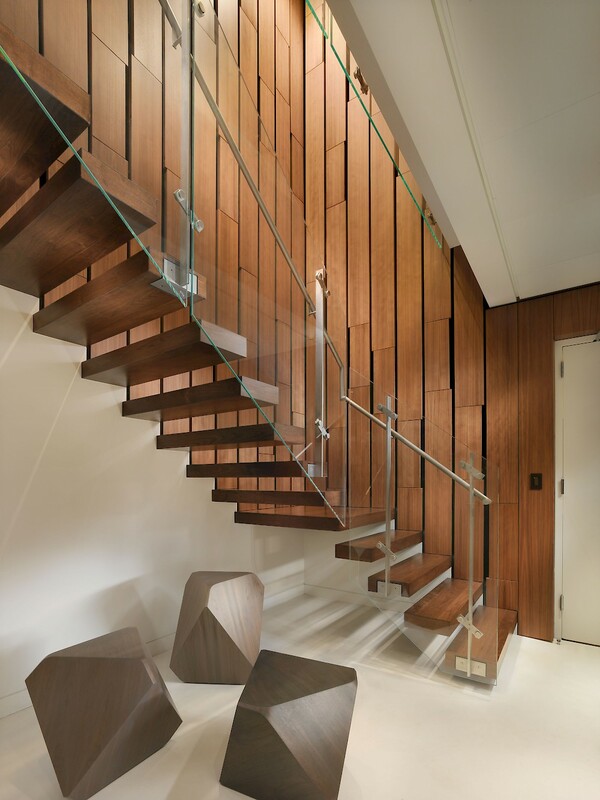 Floating wooden treads are used for this stairs that has glass railings. Notice that the other end of the treads are attached on the railings and it leads into an upper area with glass flooring. Aside from the glass elevator, it also has a lovely swirling staircase around it that has glass railings. The treads of this one is made from Corian and does look very expensive indeed and it even looked more sophisticated because of the railings. 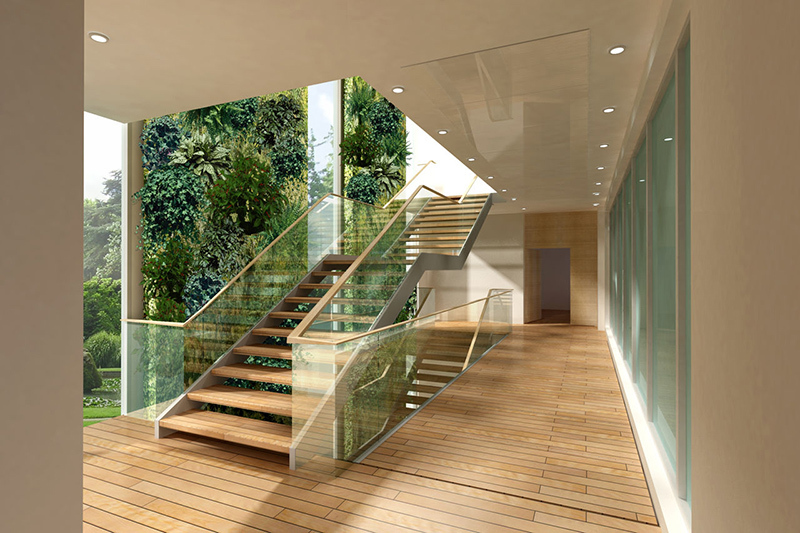 For this one, aside from using it as railings, the glass also doubles as a wall from the lower area to the upper area. And yes, it must be a very tall glass indeed. 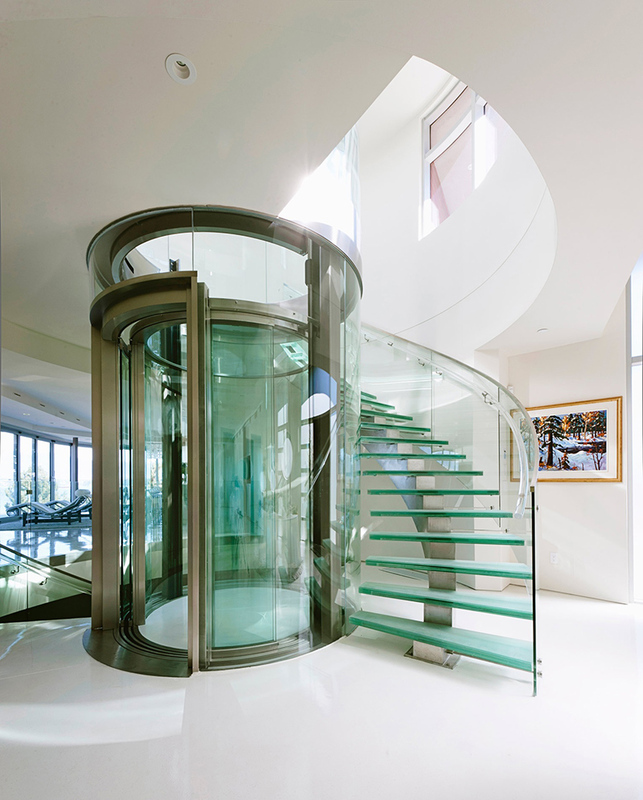 I like the look of this staircase because it appears twisted with the use of glass. If you have this in your home, it would no doubt be a unique sculptural feature. I like the wooden wall of this house as well as how it looks like with white. But you can see how those railings added appeal to this area. And also notice that on the wall are lights that illuminate the treads. I like it that instead of the usual staircase design made of wood, this one has some lovely unique touches on it from the glass material to the wooden elements on it. Seen here is a beautiful home with so many stairs. It has here a concrete staircase. You can see that at the bottom is one step that is larger and is elevated with lighting under it. I like those uniquely designed ottomans under this wooden staircase but of course we have to draw our eyes to that stairs which combines different materials. And I also like the wall along the stairs too. 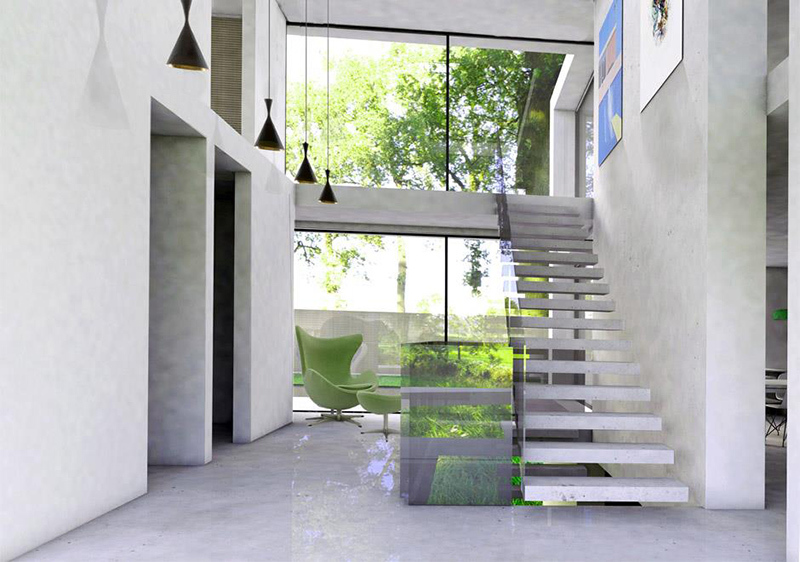 Want a minimalist home? Well this one will work for you. 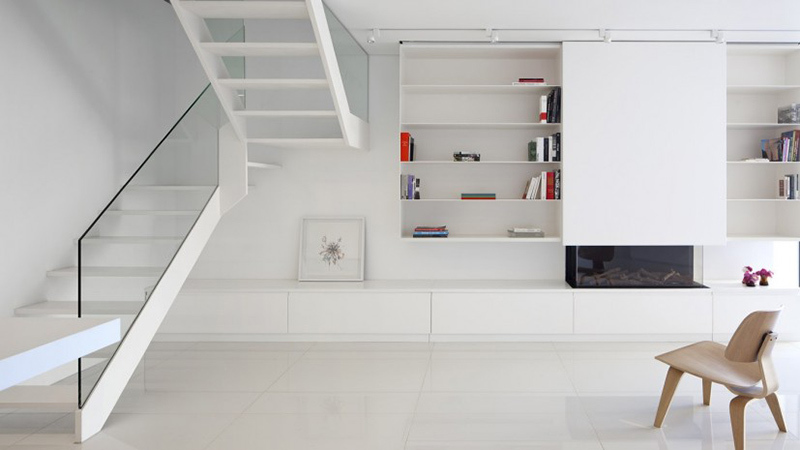 Just look at this white stairs with a very simple glass railing. But despite being simple, it does look really nice. 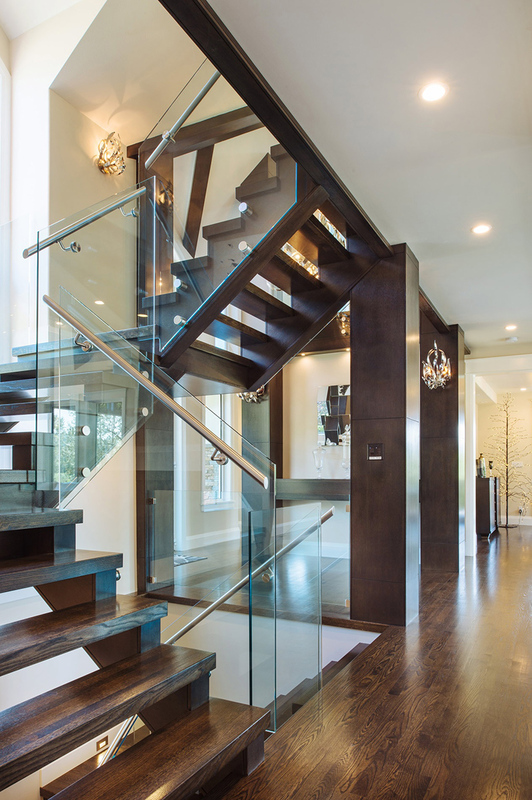 For a modern and industrial feel combined, this one used glass and iron as well as wooden treads. Floating wooden treads are used in this stairs. First stop is on an elevated working area before it leads to another landing. 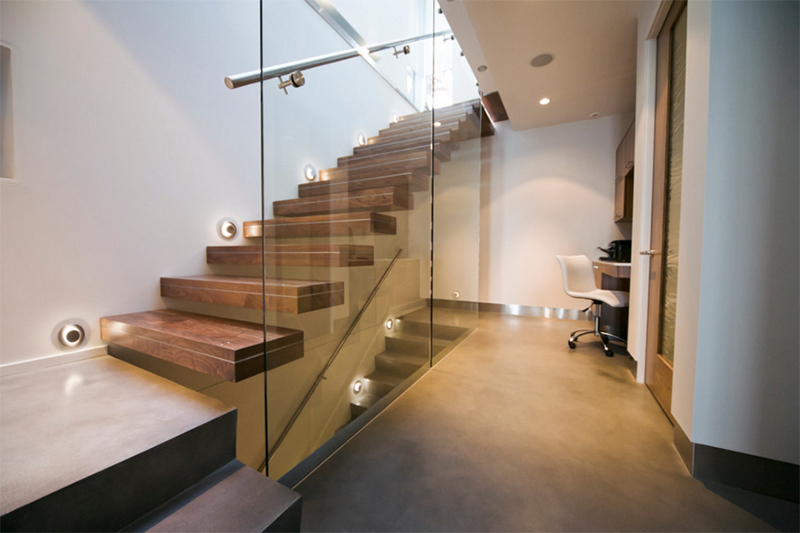 A steel staircase also looks nice with added glass on it. It is a good idea that the stairs is colored gray since it is a nice contrast with the white home. 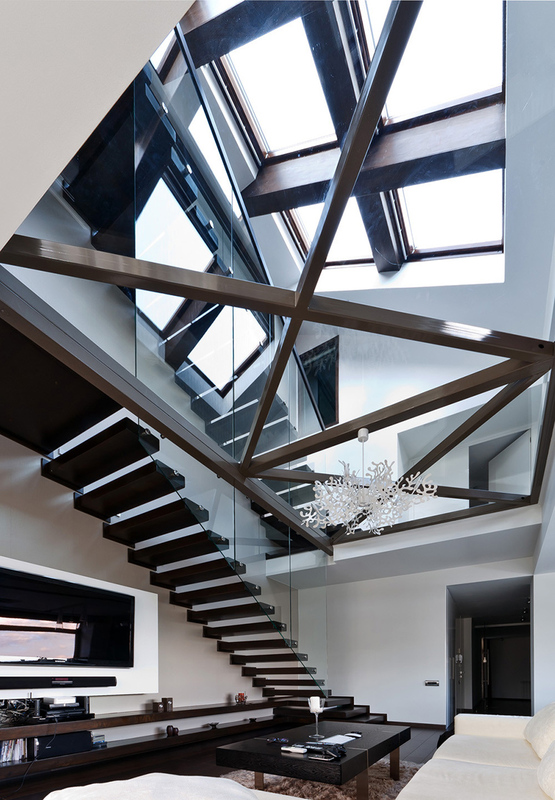 A steel and glass staircase gives the top floor of this row house a loft-like feel as it creates access to a modern roof deck on the roof. You can see that it has another photo that gives you a closer look at the stairs. This one has wood on top of the glass so you can safely hold on the railings if you want to. 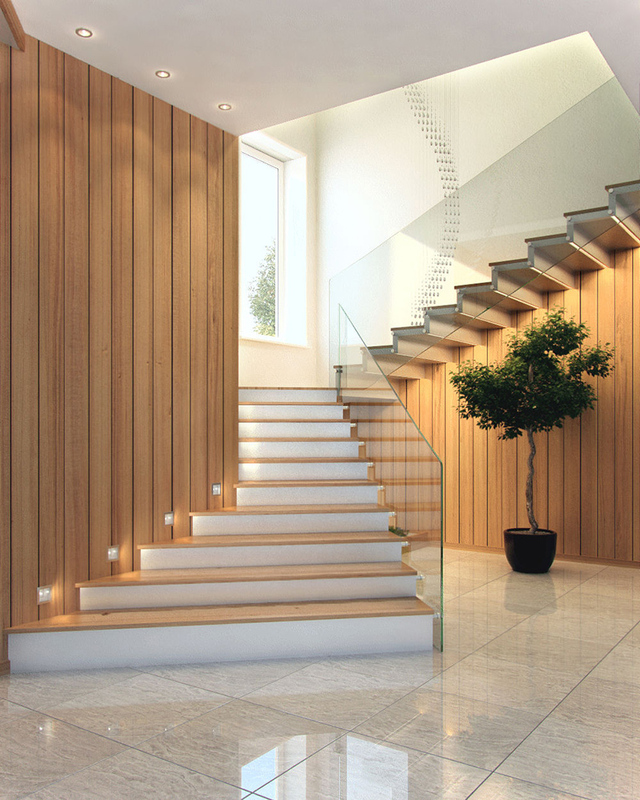 It looks good with the wooden staircase in this contemporary home. 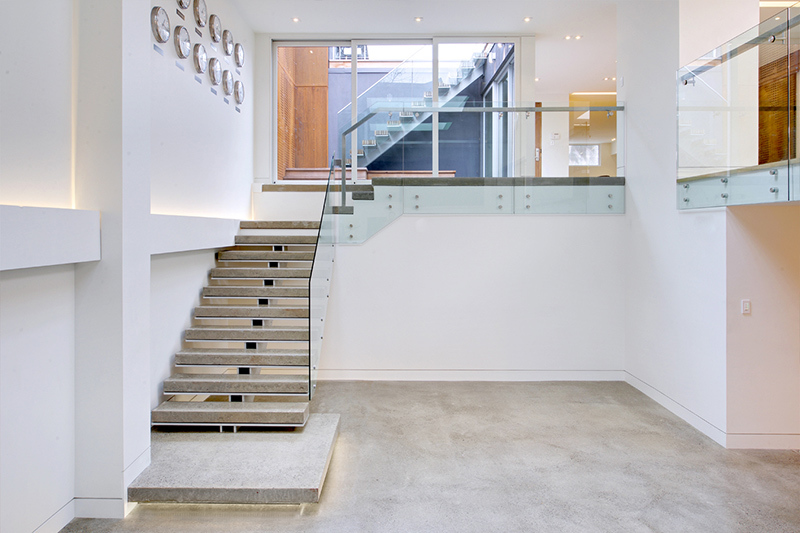 For an even more sophisticated appeal, add stainless steel to the stairs with wooden riser and treads. Aiming for a sleek look? 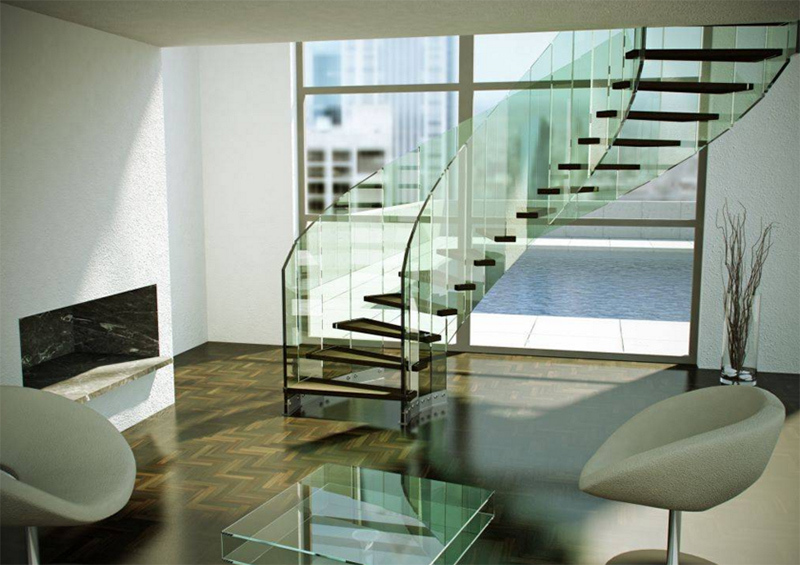 Use glass with straight edges all over the stairs. This one paired glass with dark wood. Looked great, right? Aside from the glass railings, this one also has glass treads and it is located next to a round glass elevator. For sure if you have something like this in your house, you will feel like you are in the home of Iron Man! 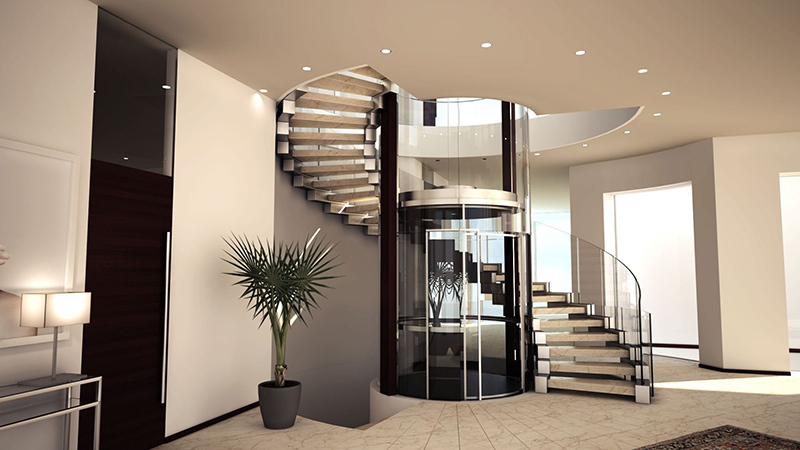 This is a helical floating staircase that is good for both commercial and residential areas. 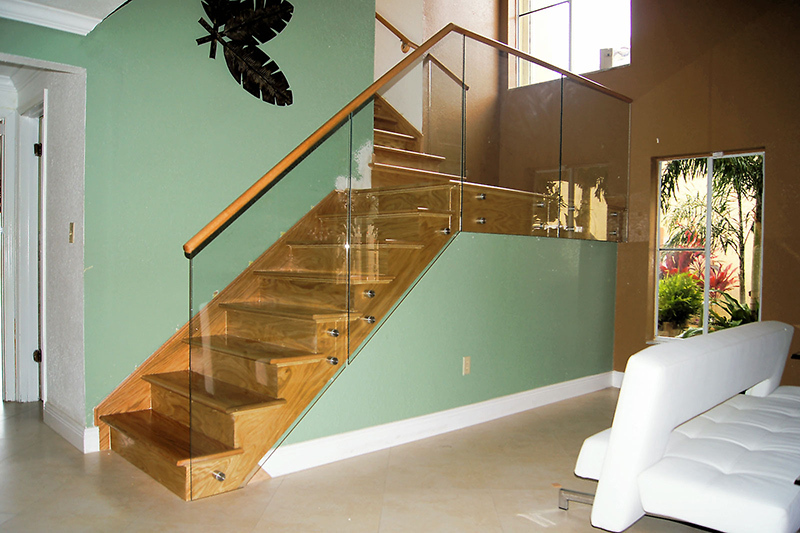 A glass railing can be curved or straight with some segmented pieces in it. Beautiful, right? 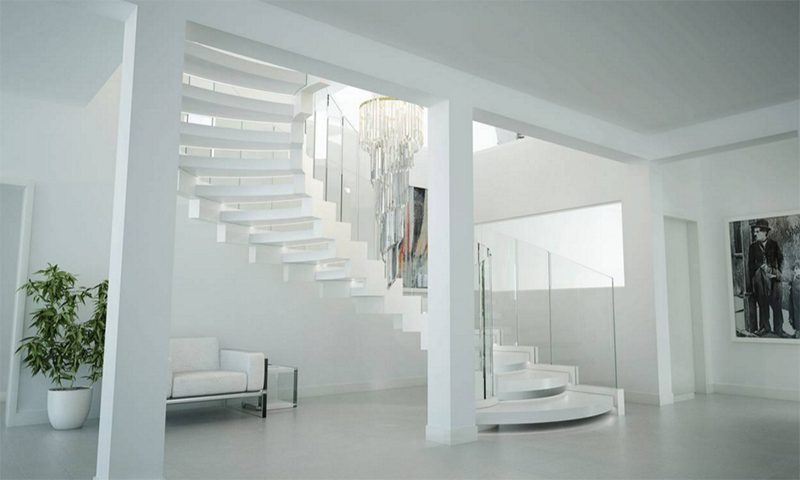 Every home may need a different kind of staircase design but it can surely look nice if use one with glass in it because aside from making the space appear larger, it also adds sophistication to the area. We have seen that in the images that we have here in this list. Don’t you just love all of them? Oh well, I like it that glass can be used with wood and other materials and still end up looking really stunning. But if you decide to use this, make sure that you will get the right kind of glass. 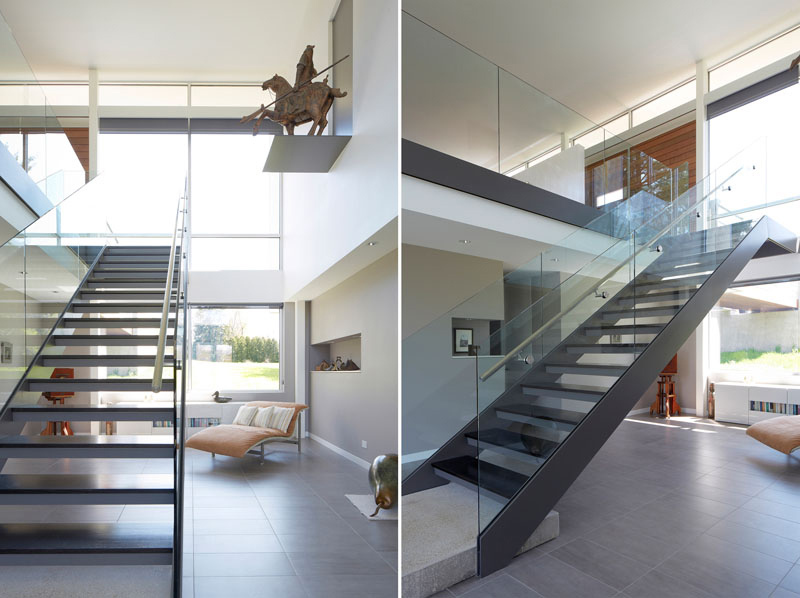 So, did you find one staircase design in this roundup that you love the most?